QCOSTARICA – The Turrialba volcano Monday afternoon spewed a fresh column of ash and rocks, reaching an heigh of 2.1 kilometres over the crater, at 3:20pm, lasting about 20 minutes. The ash reached many areas of San José around 6:00 pm, including and forced the closure of the San Jose airport, at 7:30 pm, for some 10 hours, that led to some 13 flight cancellations, mainly flights from Atlanta, Dallas, Managua, Houston, Miami, Newark and Panamá. 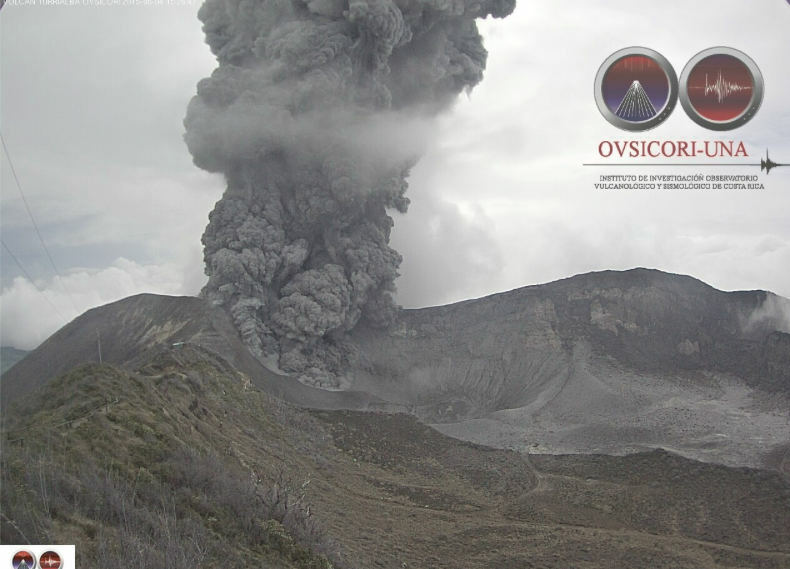 The OVSICORI camera mounted on top of the volcano caught the ballistic ejection of elements (stones ranging from 3kg to 4kg). In a report for release issued by the OVSICORI, it was reported that these stones, weighing 3kg. to 4 kg., reached about 700 metres away, mostly in the area of Turrialba Volcano National Park, which is uninhabited and whose entry is prohibited by order of the National Emergency Commission (CNE), precisely because of the risk of falling solid material. Volcanologists believe that, in an event of a large eruption, the stones will not pass a radius of five kilometres around Turrialba. Mauricio Mora, the RSN, said that in reviewing the seismic activity of Turrialba, the colossus is very unstable. The last eruption was last Thursday, light compared to the eruption of March 12. The volcano has been actively spewing out gas, smoke and ash since last October. “In recent days there was a downward trend (…), but yesterday there were small tremors signalling small changes in pressure inside the volcano and then came the eruption. So we have to analyze it to see if we can find patterns to help us know when to expect an increase in activity, ” said Mora. Previous articleTurrialba Eruption Forces San Jose Airport Closure. Again.